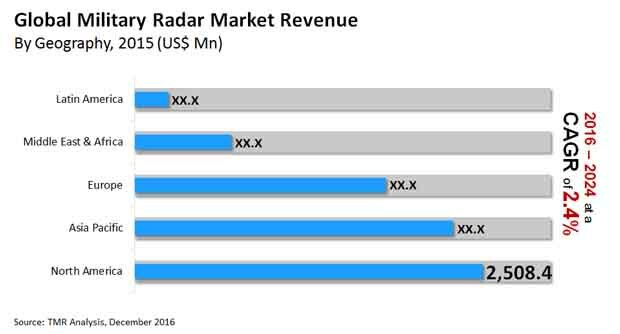 According to a recent report by Transparency Market Research (TMR), the global military radar market is moderately divided between a few leading players and a large chunk of regional vendors, owing to the vast and diverse opportunities available in the value chain. The TMR report picks out Lockheed, Raytheon, and Northrop Grumman Corporation as three most prominent companies operating in the global military radar market, who accounted for 35.4% of the market in 2015. Each of these key vendors of military radar possess a striking product portfolio and are aggressive towards maintaining their stronghold over the demand with all means possible. As per the estimations provided by the TMR report, the global military radar market will continue to prosper in the near future with increased defense budgets of several developed as well as emerging economies, projecting it to increment the demand at a CAGR of 2.4% during the forecast period of 2016 to 2024. The report has evaluated that the global military radar market was worth US$7.78 bn in 2016, which will reach a valuation of US$9.36 bn by 2024, the end of the forecast period. In the near future, the report expects the competitive landscape of military radar market to remain highly competitive, with top players indulging in aggressive expansion plans while the new entrants will also make a mark in the market via niche technology development. However, the capital requirement for the setup is expected to restrain the prospects of the new players, unless they are backed by venture capitalists with financial might. Based on product type, the TMR report segments the global military radar market into naval, airborne, ground based, and space based. In 2015, the base year of the report, the airborne military radar segment served the maximum demand, which accounted for a worth of US$2.34 bn, and is expected to remain highly profitable throughout the forecast period. This substantial demand for airborne military radars is a reflection of growing risks of air strikes and infiltration of terrorists. There are high possibilities of research and development in this segment, which will keep innovative approaches and adoptability prominent in the airborne military radar segment. Geographically, the report takes stock of the potential of military radar market in the regions of Asia Pacific, North America, Latin America, Europe, and the Middle East and Africa (MEA). Among these, North America continues to lead as most lucrative region, serving high volume of demand for military radar owing to strong backing from the government and the presence of several leading vendors in the country of the U.S. Along with Canada, the U.S. has significant investments in radar technology, which is expected to continue in the near future too. Among Asia Pacific, emerging economies such as India, China, South Korea, and Japan are rated as most profitable country-wide markets. The global market for military radar is gaining traction from various factors such as the incrementing demand for radars as militaries replace legacy systems, advent of drones, territorial conflicts among several nations, geopolitical instability in the Asia Pacific as well as the Middle East regions, and miniaturization and automation of surveillance and defense systems. On the other hand, high cost of space-based radars and growing cyber warfare are two key factors challenging the military radar market from attaining its full potential. Nevertheless, the existing vendors of this market will continue to gain new opportunities from trends such as growing use of unmanned combat systems for battlefield surveillance and counter-attack and increasing demand for ballistic missiles, provided they can overcome the issues pertaining to noise interruptions and electromagnetic jamming.